As I begin this week’s posting I wish to share with you a statement I issued earlier today concerning St. John’s Seminary. 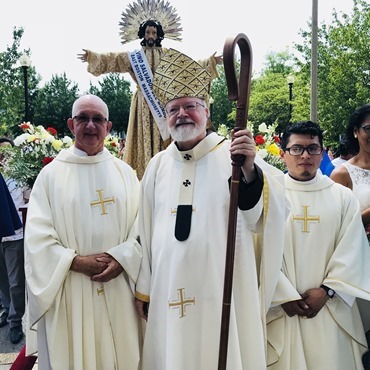 In the midst of present challenges please know of my appreciation for your prayers for any person who has been harmed by actions or failures to act on the part of the Church, and for the seminarians, faculty and staff of St. John’s Seminary. Sunday I went to Most Holy Redeemer Church in East Boston to join them for their celebration of Cristo, Divino Salvador del Mundo (Christ, the divine Savior of the world), which is the patronal feast of the country of El Salvador – the only country in the world named after Christ. 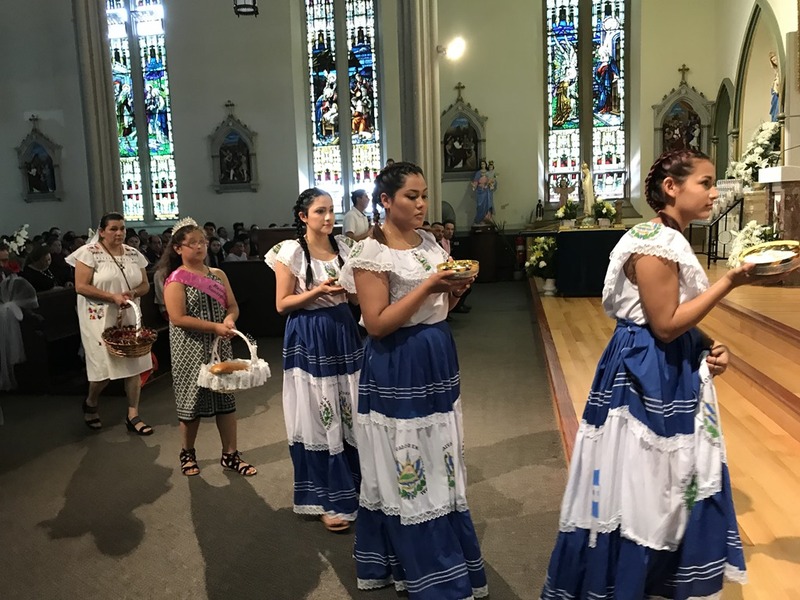 East Boston is home to the largest Salvadoran community in Boston, so it’s a very important feast, not only for the parish, but for the whole neighborhood. 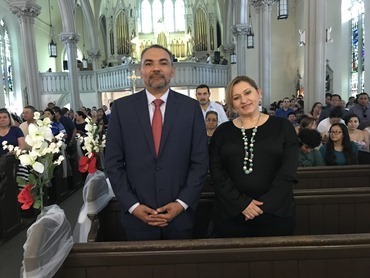 We were joined for the celebration by the Consul General of El Salvador in Boston Ruddy Lazo and Vice Consul Marina Martinez. 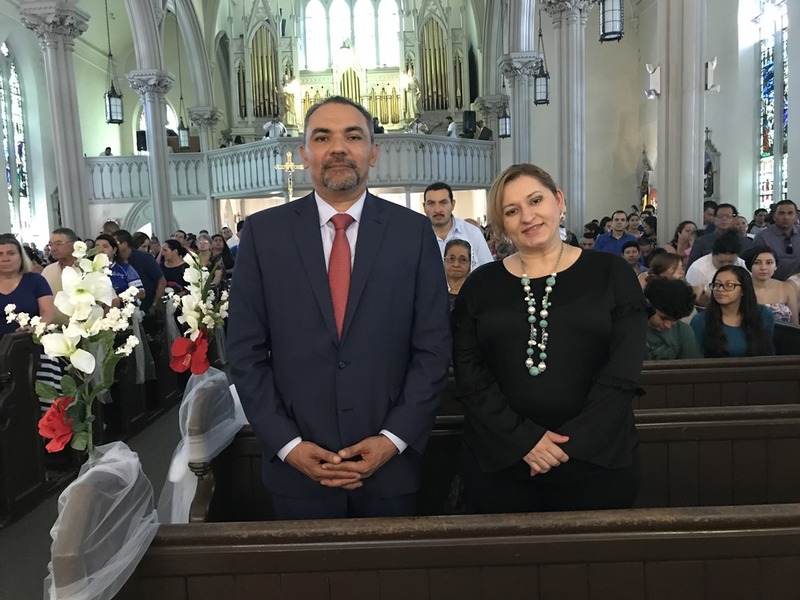 And, of course, we can’t fail to mention that Father Americo Santos, the parochial vicar at Holy Redeemer, is also from El Salvador. The statue that is carried in procession is that of the Transfigured Christ. 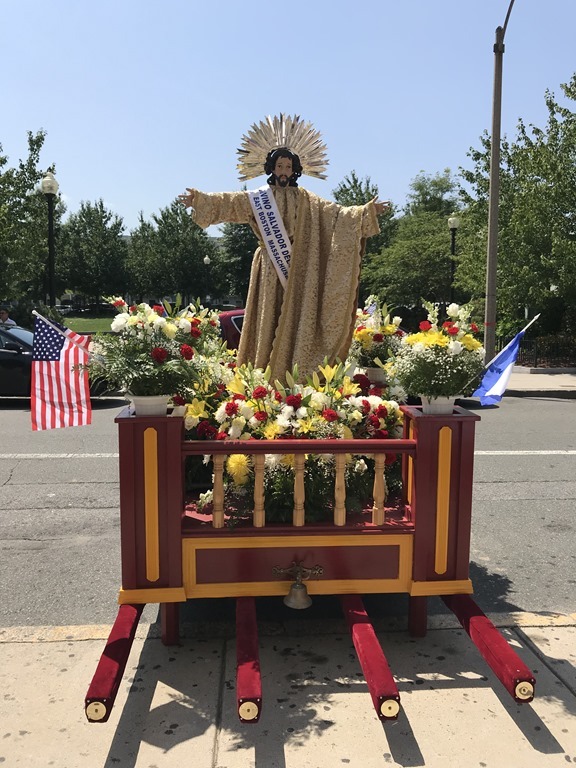 In fact, the feast is usually celebrated on the Feast of the Transfiguration, which was Monday, but it was anticipated to allow more people to participate. 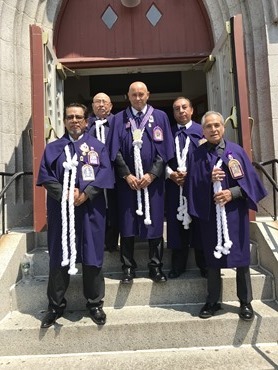 The men you see in purple are members of the Hermandad del Señor de Los Milagros (the Fraternity of the Lord of Miracles), which is a very important devotion in Peru. The procession they hold there for that feast, which is in October, is perhaps the largest procession in the world. Usually, several million people partake in it and they are all dressed in purple. Holy Redeemer Church looks so beautiful after its recent renovations. The pastor, Father Tom Domurat, and his parish have done an extraordinary job renovating the church. 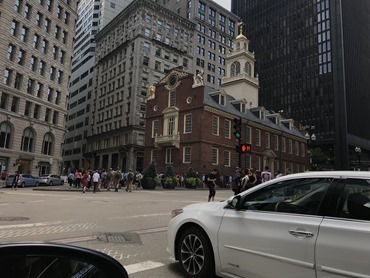 On our way back from East Boston to the cathedral, we passed by the Old Statehouse which is a beautiful historic building in downtown Boston. It was the seat of the British government during colonial times and is perhaps most well known as the site of the Boston Massacre. I took this photo because I was so impressed by the throngs of tourists packing the streets of Boston. I’ve never seen such huge crowds. Clearly, people everywhere have come to learn what we have always known — that Boston is a beautiful place to visit in the summer! Then, I departed for Baltimore to attend the annual Supreme Convention of the Knights of Columbus. 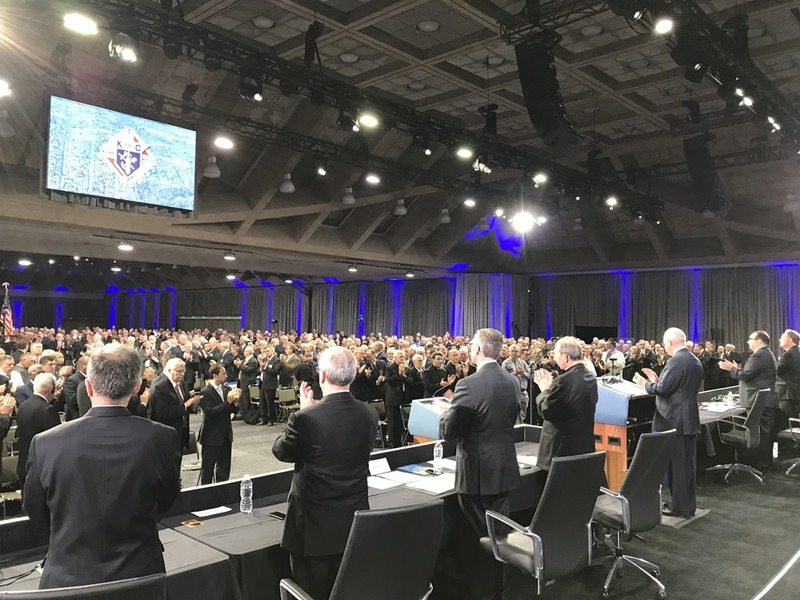 Supreme Knight Carl Anderson opened the gathering on Tuesday with an address at the business session. He updated us on the many important works of the Knights of the past year that included the contribution of more than $185 million dollars and 75 million volunteer hours to charitable works. 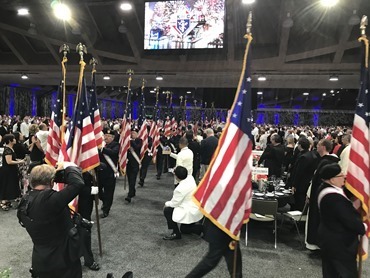 Of course, the States Dinner, which was held that night, is always an impressive sight. 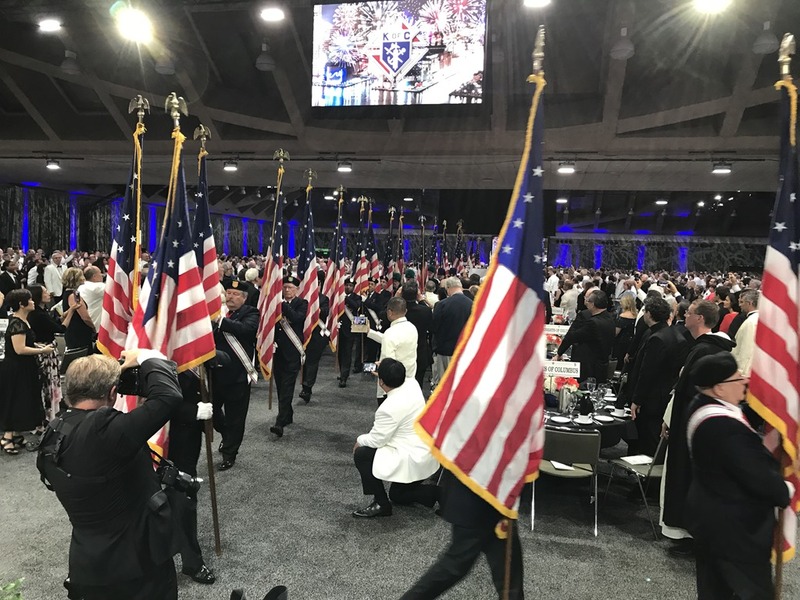 I very much enjoyed the procession of all the historical flags of the United States, beginning with the original colonial flag with 13 stars and ending with the present flag of 50 stars. 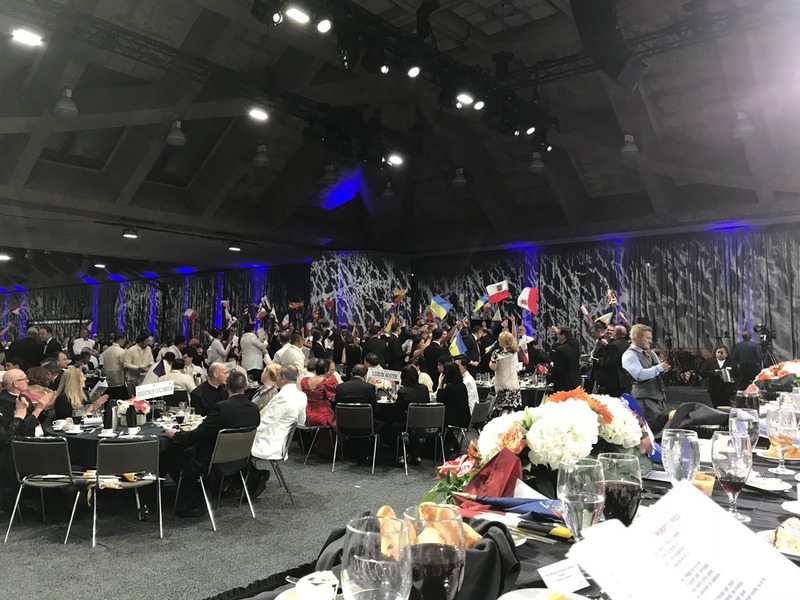 It is always very impressive to see the different delegations from all over the world in attendance. In this picture, you see the yellow and blue flag of Ukraine and the white and red flag of Poland. Among the other countries represented were the Philippines, Mexico, Canada and France. Major Archbishop Sviatoslav Shevchuk of the Ukrainian Catholic Church delivered the keynote address for us. The Ukrainian Catholic Church is the largest of the Eastern Rite Catholic Churches. Though he is called “Major Archbishop,” he is addressed as “His Beatitude” and in another Eastern Church would have the title of patriarch. 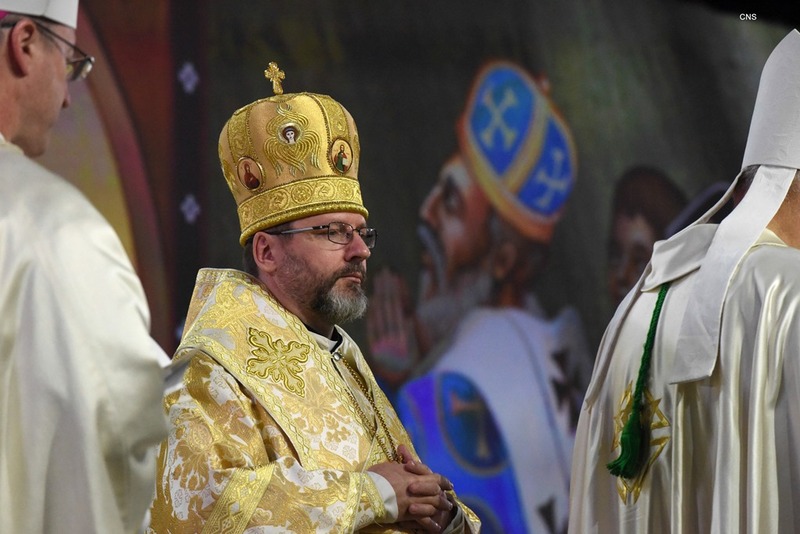 There were several Ukrainian Catholic bishops from the United States there with us, as well. 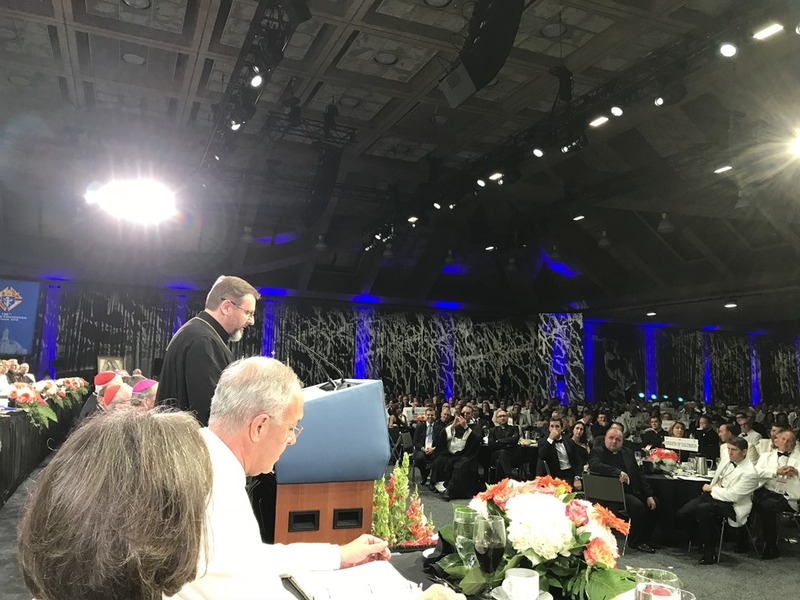 He gave a beautiful reflection on the situation of the Church in Ukraine and the importance of religious freedom. 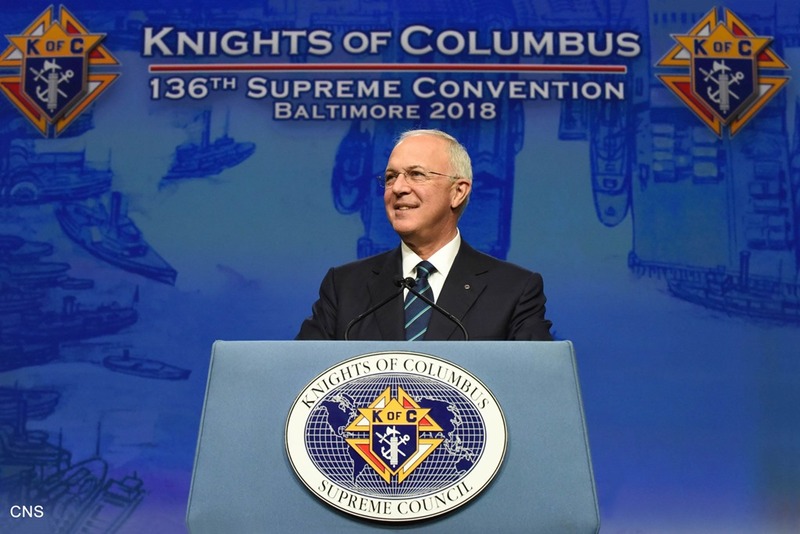 During the business session, we had also heard from Carl Anderson about the work the Knights have been doing to help the persecuted Catholics in the Middle East, including investing millions of dollars to rebuild villages in Syria so that the people can return to their homes. So, religious freedom was an important theme at the convention. During the evening, I had a chance to catch up with the members of the Massachusetts delegation. Seated is the former Massachusetts State Deputy Newman Flanagan and standing behind him is his son, the current State Deputy Paul Flanagan. 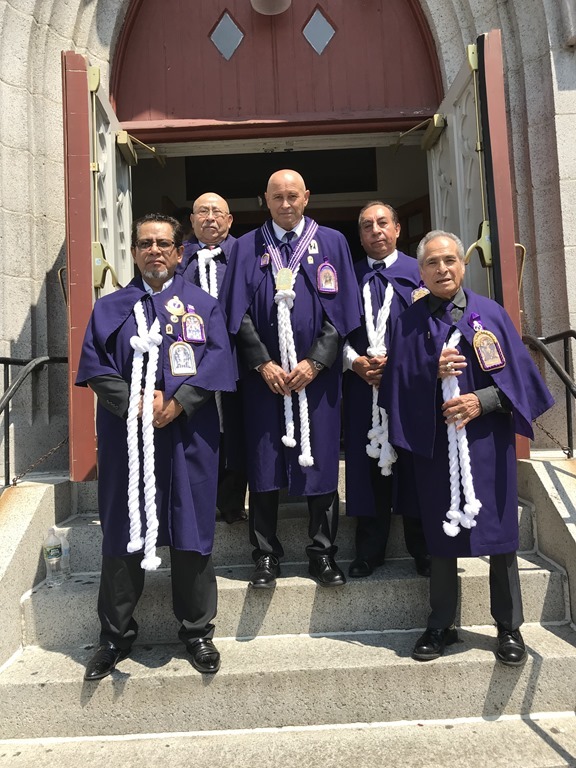 Interestingly, I learned that Newman Flanagan’s father was also state deputy, so they have three generations of leadership of Massachusetts State Council Knights of Columbus in their family — quite a legacy! 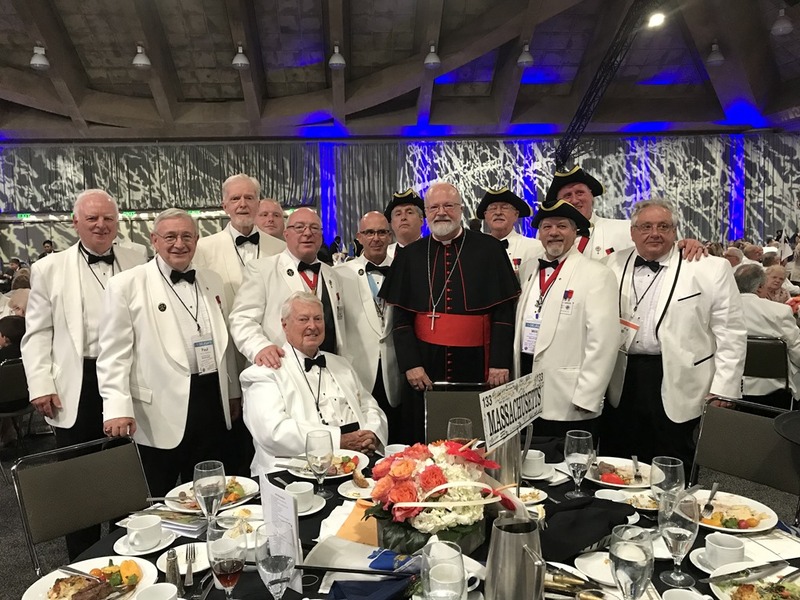 It is always very edifying to see the great works of charity that are supported by the Knights of Columbus, which now has nearly 2 million members and is the largest Catholic men’s organization in the world. They are an invaluable force for evangelization, promoting family life, and the works of mercy and justice in our Church. 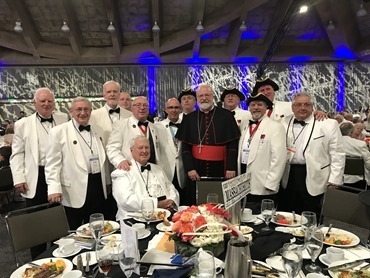 So, I am very happy to have been able to attend this year’s convention along with Bishop Robert Hennessey, Bishop Peter Uglietto and a number of our priests to show support for this vitally important organization. It is always a very uplifting experience for me. 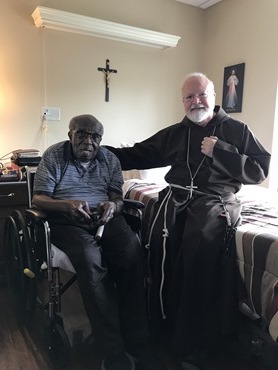 Bishop Elliott Thomas, the retired Bishop of the Virgin Islands who just celebrated his 92nd birthday, had been living with us at the Jeanne Jugan Residence in Somerville. 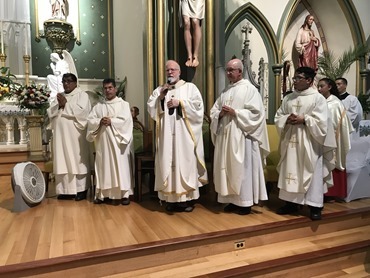 However, recently he was invited by the Redemptorist Fathers and Brothers to come to live in their retirement home near Baltimore. 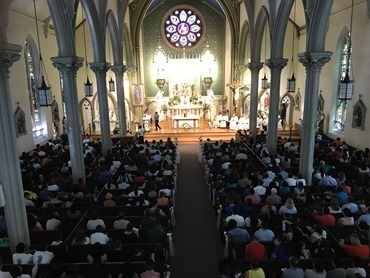 So, while I was in Baltimore, I was happy to have the opportunity to visit him and to bring him greetings from the many friends he has here in Boston. It was a joy to see how well he was doing.